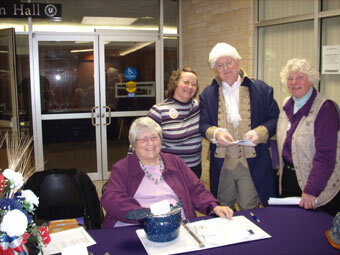 Shortly after the first "Taxed Enough Already" Tax Day Rally in early 2009, the idea of a Constitution Scholarship was proposed by Charter Member John Matta at a general meeting of the Flint Hills TEA Party. General agreement was found for us to proceed with the idea. On October 2, 2010 the founding meeting of The Flint Hills Tea Party Educational Fund, Inc. was called to order in a meeting room at the Public Library in Manhattan Kansas. The next meeting of the new Board of Directors in November of 2010, it was decided that to conduct the Constitution Bee properly more time was needed to prepare. The board agreed to delay the Bee one year and designated February of 2012 as the inaugural event date. Additional time was required to prepare our application as a 501(c) 3 organization, as well as to conduct fundraising, identify the desired scholarship requirements, set a specific date and location, disseminate information and identify the details necessary to conduct the event. The board and a dedicated cadre of volunteers moved forward with the plan insuring a timely and well-organized Constitution Bee scholarship program for high school students throughout the State of Kansas.